We have two new cooking shows we look forward to here in Wellington. 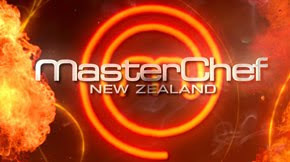 MasterChef New Zealand is shown on Wednesdays, 7:30PM, TV One. The website is a great accompaniment to the show, with contestant and judge profiles and recipes from the episodes. Another new show is New Zealand's Hottest Home Baker where the contest is on... um... baking. Unlike MasterChef, I think that this show has a lighter atmosphere to it, perhaps because the hosts (one of them being New Zealand’s Next Top Model judge Colin Mathura–Jeffree) do not exude stern authority, and Colin banters with the contestants. I dabble with baking only occasionally and have not yet graduated from muffins so I also find this series interesting. Last week, they made New Zealand classic baked goods Pavlova and scones. I've tried scones one time but with disastrous results unfortunately, so I still have a long way to go. I think.